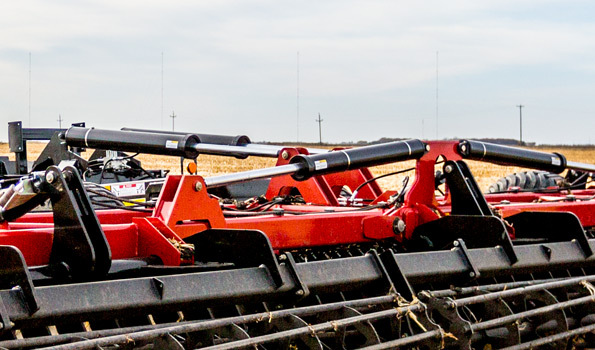 The Farm king high speed compact disc excels at managing difficult residue in challenging field conditions. 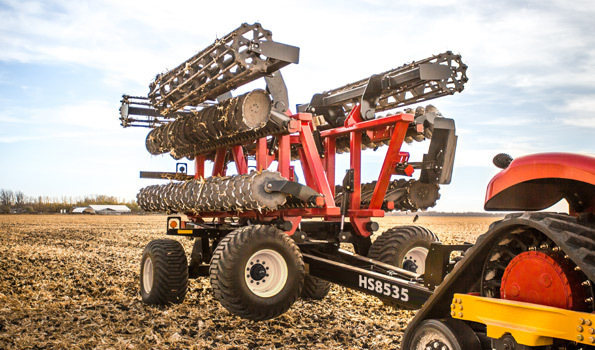 Designed for high speed operation, it is more productive than traditional tillage since it operates at field speeds of 8 - 12 mph (12 - 20 km/hr). Two rows of blades set at a compound angle achieve a full cut at 2.5" (63 mm) working depth. 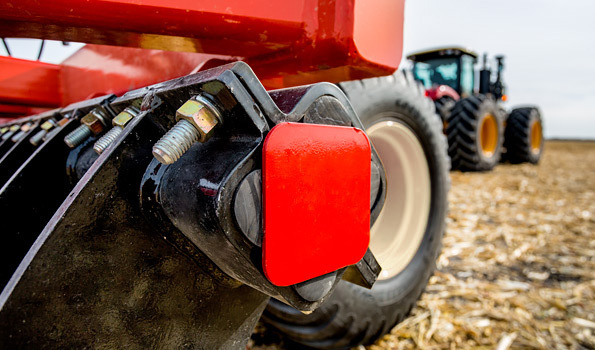 This means no uneven ground surface left to hinder planting operations. 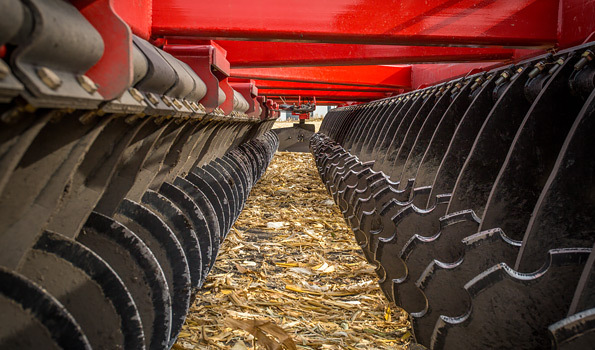 Four blade size options: 20" to 26" (508-660 mm) and the choice of 3 rear finishing attachments: steel cage roller; corrugated rubber roller or a spring roller makes the Farm King High Speed Disc fully customizable for your local residue, field and moisture conditions. Transport width 11' 10" 11' 10" 11' 10" 11' 10"
Transport height 13' 5" 13' 5" 13' 5" 13' 5"
Working depth 2.5" - 5"
Blade spacing 10" with rear blades positioned between front blades so the result is 5" spacing which provides a full cut at 2.5" working depth. Blade sizes: 20" x 6.5 mm; 22" x 6.5 mm; 24" x 8 mm; 26" x 8 mm, notched or plain, shallow concave to minimize compaction. Rock protection: Each blade is protected by 4 rubber torsion elements which absorb impact and allow the arm to move up/down independently. The entire frame is designed to float front-to-back and wings up/down so the machine will follow ground contours and maintain consistent cutting depth in rolling or uneven terrain. 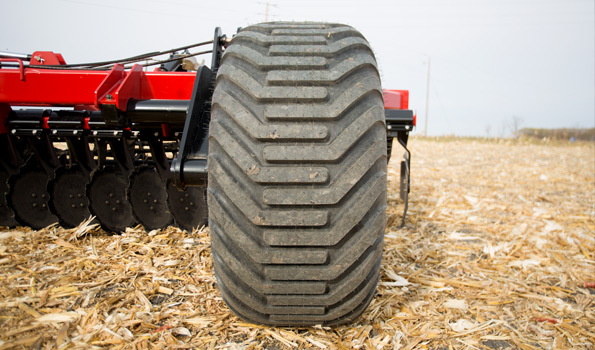 Large radial tires provide an extremely wide footprint for maximum flotation in wet ground and minimize compaction in all field conditions. Excellent transport dimensions - under 12’ wide (11’ 10”); 13’ 5” high. Tears up residue at 8 – 12 mph. Ensures even distribution of residue to eliminate challenges such as uneven or delayed emergence, hair pinning, erosion or planter/ hoe-drill plugging. Disc arms are supported by 4 (torsion) pre-loaded rubber spring elements that allow each disc to behave independently of all others. 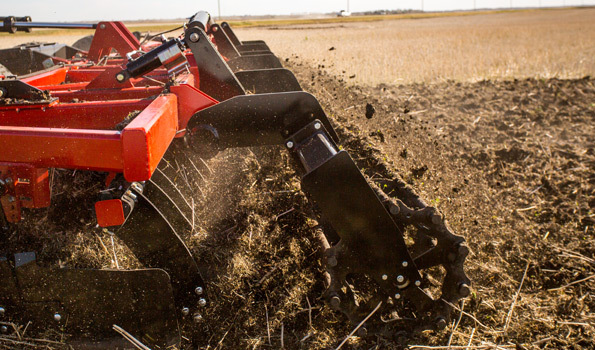 Each blade can move up/ down to react to changing ground conditions: ruts/ rocks while automatically springing the arm and blade back to its operating position. Rear blades are positioned between front blades. Adjustable rear mounting bar allows fine-tuning spacing for blade size and wear. "Full Cut" is achieved at 2.5" working depth.